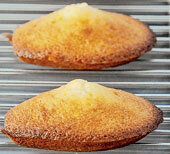 Madeleines, financiers and such typically French baked delights will soon be available in Calcutta. And making them would be boys from a home for physically disabled orphans, who are now being trained by French chefs. The boys of Shuktara would be serving their first oven-fresh fare for city hoteliers and restaurateurs to taste under the watchful eye of their guardian angel David Earp on Friday. “The idea is to build a client base for them to supply their products and to become self-reliant,” said Earp as the boys measured, mixed and whisked ingredients for a fresh batch of fruit cake in their Behala kitchen. The story of Shuktara started with Earp, a British textile dealer, coming to Calcutta in the mid-90s to explore business opportunities. The plight of three orphaned kids with disability made him open a home in 1999, with local lad Pappu Mishra as his lieutenant. The boarders number 19 now. “Three years ago, I met David who told me about Shuktara and his worry about what would become of the boys after him. Meeting them was such an emotional experience that I joined his cause,” says Alain Cojean, who runs 22 restaurants in Paris and has started a foundation called Nourrir aimer donner (Eat love give). Cojean approached Fabien Rouillard, executive pastry chef of Fauchon, a century-old gourmet food company, and Florence Colonna, a former colleague. Once a space was acquired at Silpara near the home, cake pans and a giant Eurofours oven that can bake 70lbs of cake at a time were flown in. Along with customs charges, it cost them euro 10,000. “I can’t afford this in my restaurants,” smiles Cojean. The rest was bought locally. “We have chosen items that use similar ingredients and can be made in many flavours and sizes,” said Rouillard, who supervises Fauchon bakeries across the world. Over the past couple of days, the boys have had their hands full learning how to operate the machines and bake. Ashok Chhetri, whose face and neck are twisted by cerebral palsy, whisks a mixture of flour and baking powder with all his energy even as Pinku Das, who is hearing impaired, studies the ingredients required to make poppy seed lemon cakes and passes on the measures to Raju Das, all the while communicating in sign language. Raju, whose legs are partially affected by palsy, meticulously weighs the ingredients. Their immediate target is to produce 2,000 cakes for Friday’s guests. “They have a home to stay in and a job to support them. Now I can retire,” smiles Earp. To read original article please click here.